Does not Contain Yeast‚ Wheat‚ Corn‚ Soy‚ Milk‚ Salt‚ Sugar‚ Preservatives‚ Artificial Color‚ Magnesium Stearate. 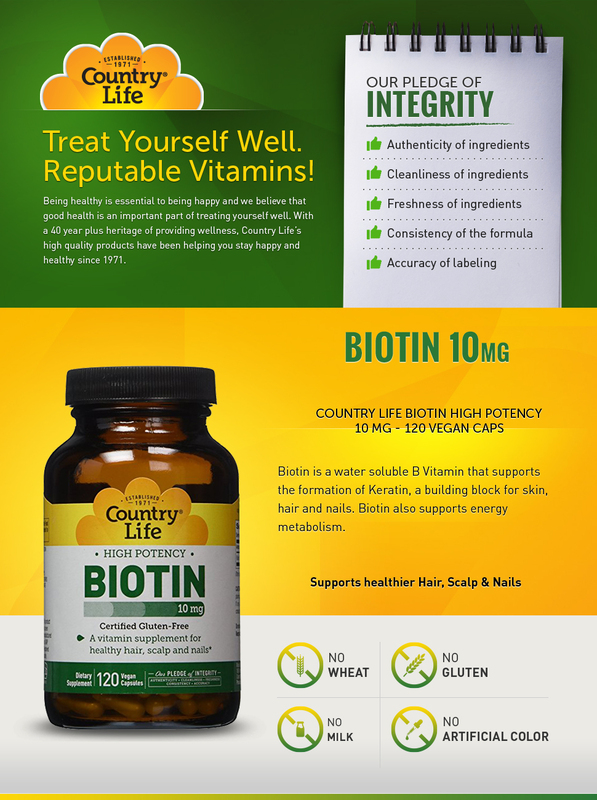 SUPPORTS KERATIN FORMATION - Country Life's Biotin dietary supplement supports the formation of Keratin, a building block for skin, hair and nails. SUPPORTS HEALTHY METABOLISM - Biotin, also known as Vitamin B7, supports metabolism energy. GLUTEN FREE, VEGAN & KOSHER PAREVE- Gluten Free Certification provided by GFCO.org. Vegan Certification provided by the American Vegetarian Association (AVA).